The SNP will set out the timescale for a possible second referendum on independence in its manifesto for next year's Scottish Parliament election. But First Minister Nicola Sturgeon said she would only hold another referendum if she was confident she would win. Opposition parties accused Ms Sturgeon of breaking her "once-in-a-generation" referendum promise. At every single stage this is something that is driven by and decided by the people of Scotland, not by politicians"
Scots rejected independence by 55% to 45% in last year's referendum held on 18 September. Since last year's result, the SNP has gained thousands of new members and won 56 of Scotland's 59 seats in May's general election. 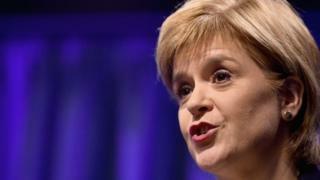 Ms Sturgeon has come under increased pressure to clarify her position on a second vote ahead of the party's conference in Aberdeen next month. She said: "Our manifesto will set out what we consider are the circumstances and the timescale on which a second referendum might be appropriate, but we can only propose. "It's then for people in Scotland, whether it is in this election or in future elections, to decide whether they want to vote for our manifesto and then if there is in the future another independence referendum, whether that's in five years or 10 years or whenever, it will be down to the people of Scotland to decide whether they want to vote for independence or not. The SNP went into the last Holyrood election with a clear commitment to hold an independence referendum. They said it would take place in the second half of the parliamentary term and it did on 18 September 2014. Party leaders used to describe this as a "once in a generation" or even a "once in a lifetime" event. They no longer do. They reserve the right to ask the independence question again much sooner than that. As the referendum anniversary approaches, Nicola Sturgeon is promising to set out "the circumstances and the timescale" for a re-run in her 2016 Holyrood manifesto. But don't expect the sort of unequivocal commitment the SNP gave in 2011. Instead, expect scenarios that could trigger a ballot, such as a UK vote to leave the EU in which Scotland has voted to stay in. In any event, Ms Sturgeon does not want to hold another referendum unless she is sure of winning. Ms Sturgeon has previously said a material change in circumstances, such as Scotland being taken out of the EU against its will in the forthcoming in-out referendum on UK membership, could act as a trigger for a second referendum on independence. She said: "Ironically, given the scaremongering about our European Union membership during the independence referendum, if we find ourselves being taken out of Europe against our will I think it is beyond any doubt that people will at least want to consider again the question of independence." She added: "I've always believed that Scotland will become an independent country so there's no change in position there. I think that's the direction of travel we're on. But that's my opinion, I'm one person, one politician. "Whether I end up being proved right or wrong will be down to what the majority of people in Scotland decide." Ms Sturgeon has also revealed in an STV documentary that she would only hold another referendum once she was satisfied "there is support in Scotland for independence that means that referendum is going to be successful". She said: "I don't ever want to feel what I felt in the early hours of 19 September. "Immediately afterwards, the mood was one of utter devastation and I felt that personally. We were all grief-stricken." Scottish Conservative leader Ruth Davidson said: "Nicola Sturgeon has now made it clear that she wants to take Scotland back to another referendum, with all the uncertainty and division that entails. Image caption Scottish Conservative leader Ruth Davidson said another referendum would lead to "uncertainty and division"
"This is despite the fact that only last year she promised Scots that last year's referendum would be once in a generation. "Most people in Scotland want to put last year's referendum behind them and get on with life. Despite her own promises, it is now clear that Nicola Sturgeon wants to take Scotland back to a neverendum." Scottish Liberal Democrat leader Willie Rennie said: "People who regretted the divisive nature of the referendum and thought that democracy counted will be disappointed that Nicola Sturgeon is putting another referendum as a priority in her manifesto. "A year after she promised us that it would be a once-in-a-lifetime event she is now putting her party first before the country by plunging us into another protracted campaign for independence. "With the police in crisis, the NHS in difficulty and educational standards slipping, we need a government focused on the challenges in our daily lives rather than their own political ideology." Labour's Shadow Scottish Secretary Ian Murray said: "While Labour is facing the future with new leaders who have an overwhelming mandate for change, the SNP are stuck in the arguments of the past. "The SNP want the next election to be about the past arguments on independence because they can't defend their record in government." Also in the STV documentary, Labour's Alistair Darling, who led the Better Together campaign, criticised the Nationalists for perpetuating the divisions that emerged during the referendum campaign. "Evel is a piece of nonsense and it should be rejected," he said. "It doesn't work and will never work... we need to get it right... otherwise the consequences will be fatal." He added: "I have never come across some of the divisions (seen during the referendum), amongst friends, amongst family, people saying things to each other that I would have thought unbelievable."